Our 24 hour pet hospital is located in the Town Center area of Virginia Beach and serves the Hampton Roads area. Like its sister hospital in nearby Chesapeake, it draws from Norfolk, Suffolk and Newport News, along with parts of North Carolina, including Edenton, Elizabeth City, Eure, Grandy, Kill Devil Hills, Kitty Hawk, Moyock and Nags Head. Emergency: Call ahead to our Town Center BluePearl emergency pet hospital and let us know you’re coming. No appointment is necessary for emergency care. Learn more about your emergency visit. 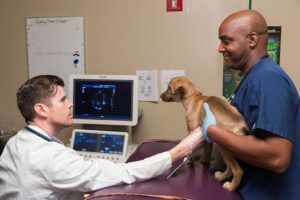 Pet owners along the eastern Virginia and North Carolina coast come to our Town Center hospital in Virginia Beach for 24 hour emergency vet medicine and specialty care. 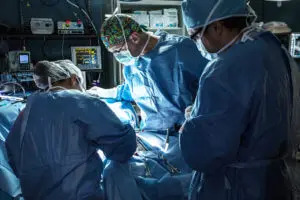 Our surgery services include both orthopedic and soft tissue surgeries. Among the advanced diagnostics available are CT scans, ultrasound, digital radiology and endoscopy. The 14,000-square-foot facility is conveniently located along Independence Boulevard south of Interstate 264 (the Norfolk Virginia Beach Expressway).